Health & Safety continues to be (and will remain) a key area of focus for clubs. Conversations with Centre Managers and Committees in Clubs around the country have shown that there are still many who are overwhelmed by what they need to do and don’t know where to start. The key thing is to make a start – take the first steps and then keep chipping away bit by bit. As a starting point download the Gymnastics NZ Health & Safety Guidelines – this resource takes you through everything you need to do in a way that is practical and relevant to gymnastics clubs. If you already have the resource, commit to working on one area of health & safety per week or per month – anything to keep you moving forward. Contact your Regional Relationship Manager if you would like more support with health & safety. 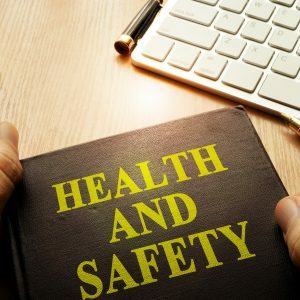 There are many myths relating to health and safety – have a read through this article by WorkSafe NZ which explains and dispels many of these. It is very important to remember that Clubs must report any notifiable events to both WorkSafe NZ and Gymnastics NZ as soon as possible after occurring. See more information about how to determine whether something is notifiable and remember you can always contact WorkSafe NZ to check. We are increasingly aware of the significant impact mental health issues can have. Looking after the mental health and wellbeing of workers in our clubs is an important part of a club’s responsibilities under the Health & Safety at Work Act 2015. The following resource has been put together by the Mental Health Foundation of NZ to provide managers with practical tips to help with conversations about mental health in the workplace. This guide provides information and guidance for managers to support someone experiencing mental distress with the aim to retain them in the workforce. A reminder that police vetting needs to be re-done every two years. For many, this will be coming up soon, if it hasn’t already done so. See the process for police vetting. 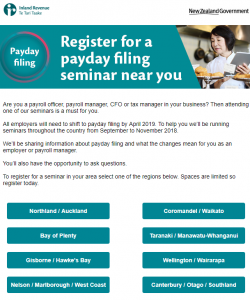 For everyone who employs coaches and/or staff, it is important to know that the IRD are changing their PAYE filing requirements. From 1 April you are required to file every payday rather than the current 20th of the month. You are able to start now so no need to wait until April to get your new processes in place.